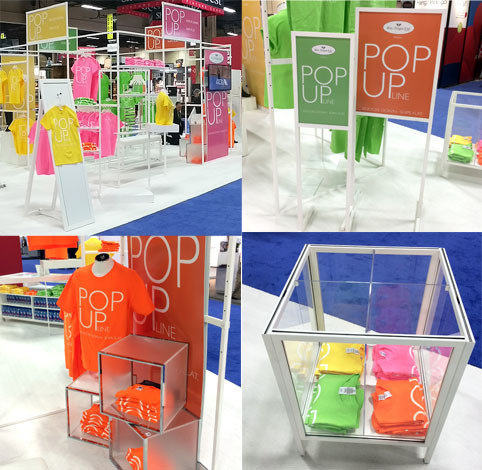 Point of Purchase Displays - Our "Pop - Up Line"
This year at the world’s largest annual show for retail design and in-store solutions - GlobalShop, we showcased our latest and greatest point of purchase collection - Pop-Up Line! All white powder coat fixtures displayed on white carpet were accented with colourful T-shirts - yellow, green, orange and pink, gave the booth a light and airy feeling with a twist of fun. The main attraction in our booth was the centre, oversized Hangrail House used for featuring product branding - a modular freestanding merchandising system that can be set up in any arrangement by using its optional shelving, cross rails and poster holders. Along with this set up, we also showed off floor Merchandisers and fold out shelving units. They ship flat, knock down, assemble fast, look great and store with ease. View photos and dimensions of all the Point of Purchase Displays and Fixtures in our Pop-Up Line.